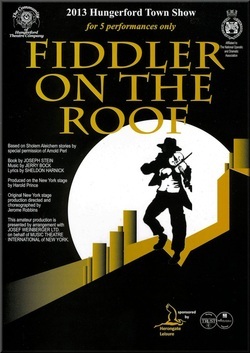 Fiddler on the Roof was set in Tsarist Russia in 1905. It is based on Tevye and his Daughters (or Tevye the Milkman and Other Tales) by Sholem Aleichem. The story centred on Tevye, the father of five daughters, and his attempts to maintain his family and Jewish religious traditions while outside influences encroach upon their lives. He must cope both with the strong-willed actions of his three older daughters—each one's choice of husband moves further away from the customs of his faith—and with the edict of the Tsar that evicts the Jews from their village. The original Broadway production of the show, which opened in 1964, had the first musical theatre run in history to surpass 3,000 performances. Fiddler held the record for the longest-running Broadway musical for almost 10 years until Grease surpassed its run. Karen Ashby, Lara Ashby, Stephen Blackmore, Shaun Blake, Tyrell Bossom, Tessa Brown, Beth Buckland, Roger Burn, Shirley Dancey, Elizabeth Frith Powell, Molly Hall, Peter Harris, Alison Horne, David Howard, Jennifer Hyde, Penny Locke, Niall Madden-Blain, Chrissy Marsh, Maisie Matthews, Peyton Matthews-Hewer, Nicole Morrison, Charlie Mula, Hoffi Munt, Kjell Nilsson, Louise Nilsson, Simon Pembroke, Jane Pike, Paul Sanday, Charlotte Shanahan, Georgie Shanahan, Roger Thompson, Carol Throup, Sean Uprichard, Katrina Vallance, Aaron Williams, Michaela Williams, Amanda Wood, Shaun Wood. Hattie Digweed, Rebecca Gennard, Caityn Gregory, Rebecca Hale, Reese Matthews-Hewer, William Owens, Jasmine Pieri, Georgina Price, Adam Quinn, Toby Quinn, Jacob Smith, Lilly Stephens, Joanne Vallance, Keighan Williams. Stephen Blackmore, Shaun Blake, Beth Buckland, Rodger Burn, Paul Hyde, Williams Owen, Angus Lowe, Charlie Mula, Hoffi Munt, Simon Pembroke, Charlotte Shanahan, Georgina Shanahan, Shubha Shetty. Set Painters - Laura Fairchild, Shaun Blake, Roger Burn, Elizabeth Frith-Powell, Pam Garraway, Penny Locke, Chrissy Marsh, Maisey Matthews, Kjell Nilsson, Louise Nilsson, Adam Quinn, Toby Quinn, Paul Sanday, Charlotte Shanahan, Georgina Shanahan. Costume Team - Stephen Blackmore, Elizabeth Frith-Powell, Jennifer Hyde, Liz Johnson, Ros Kitson, Pauline Matthews, Carol Throup. Children's Chaperones - Sheila Bamford, Jane Hall, Clare Matthews-Hewer, Maria Leon, George Olney, Sarah Olney, Clare Price, Samantha Roscoe.